A canelé (French: [kan.le]) is a small French pastry flavored with rum and vanilla with a soft and tender custard center and a dark, thick caramelized crust. It takes the shape of a small, striated cylinder up to five centimeters in height with a depression at the top. A specialty of the Bordeaux region of France, today it is widely available in pâtisseries in France and abroad. 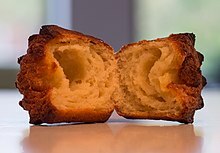 A canelé pulled in half, showing the contrast between exterior and interior. A large air pocket can be caused by several variables, such as excess egg white, unrested batter, or incorrect temperature. The canelé is believed to originate from the Couvent des Annonciades, Bordeaux in either the 15th or the 18th century. The modern word "canelé" originates in Gascon, which was spoken in Bordeaux and a large area of southwestern France until the 19th century. In Limoges, there was a food called canole, a bread made with flour and egg yolks, which may be the same item as that sold in Bordeaux since the 18th century under the name of canaule, also written canaulé or canaulet. Artisans known as canauliers who specialized in baking them registered a Corporation (or guild) with the Parliament of Bordeaux in 1663, which allowed only them to produce several specific foods: Blessed bread, canaules, and Retortillons. Since they were not a part of the Pastry Corporation (Guild), which had a monopoly over baking with milk and sugar or mixtionnée dough, they were prohibited from using those ingredients. The canauliers disputed the Pastry Chefs' privileges and on 3 March 1755 the council of State in Versailles ruled for the canauliers and ended the Pastry Chefs' monopoly. An edict of 1767 limited the number of authorized canaulier shops in a city to eight. It created very strict requirements for joining the profession. Nevertheless, in 1785 there were at least 39 canaulier shops in Bordeaux, at least ten of which were in the district (faubourg) of Saint-Seurin. The French Revolution abolished all the Corporations, but later census rolls continue to show shops of Canauliers and bakers of "blessed bread". In the first quarter of the 20th century the canelé reappeared, even if it is difficult to date exactly when. An unknown pastry chef re-popularised the antique recipe of canauliers. He added rum and vanilla to his dough. It is likely that its current shape comes from the similarity (in French) of the word wave with the word "cannelure" (fluting, corrugation, striations). The modern name "canelé" is of recent origin. The Guide Gourmand de la France does not mention it. Only in 1985, after the pastry's popularity had begun to explode, was the Brotherhood of the Canelé of Bordeaux (Confrérie du Canelé de Bordeaux) created and the second "n" of its name removed. The name canelé became a collective brand, registered with the National Institute of Industrial Property of France by the Brotherhood. Ten years after the registration of the brand, there were at least 800 manufacturers in Aquitaine and 600 in the Gironde. In 1992, Gironde alone consumed an estimated 4.5 million canelés. The canelé is traditionally baked in a small cylindrical fluted mold. Traditionally the molds were brushed with beeswax, but today butter is used. Produced in numerous sizes, they can be consumed for breakfast, for snacks, and as a dessert depending in some measure on size. Canelés can be paired with red wine and many other beverages. Traditionally, "canelés" or "cannelés of Bordeaux" are generally sold in bunches of 8 or 16. In Paris, most of the famous shops such as Ladurée and Pierre Hermé still spell it as "cannelé of Bordeaux" with double 'n'. ^ a b Aquitaine: produits du terroir et recettes traditionnelles (in French). A. Michel. ISBN 9782226087225. Retrieved 1 October 2016. ^ a b Krondl, Michael (2015). The Oxford Companion to Sugars and Sweets. Oxford University Press. p. 259. Retrieved 30 March 2015. ^ a b MacNeil, Karen (2001). The Wine Bible. Thomas Allen & Son. p. 151. Retrieved 30 March 2015. ^ a b Hochbaum, Susan (2011). Pastry Paris: In Paris, Everything Looks Like Dessert. Little Bookroom. p. 120. Retrieved 30 March 2015. ^ Khoo, Rachel (2014). My Little French Kitchen. Chronicle Books. p. 98. Retrieved 30 March 2015. ^ Fabricant, Florence (25 February 1998). "TEMPTATION; A French Morsel With Its Own Memories". The New York Times. Retrieved 1 October 2016. ^ Leade, Sara Crompton (2012). Waking Up In France. p. 295. ISBN 978-1478235309. Retrieved 30 March 2015. Wikimedia Commons has media related to Canelés bordelais.